The Premier League is in its 24th season since the 1992-93 breakaway in English football. Forty-seven different clubs have played in it since then. 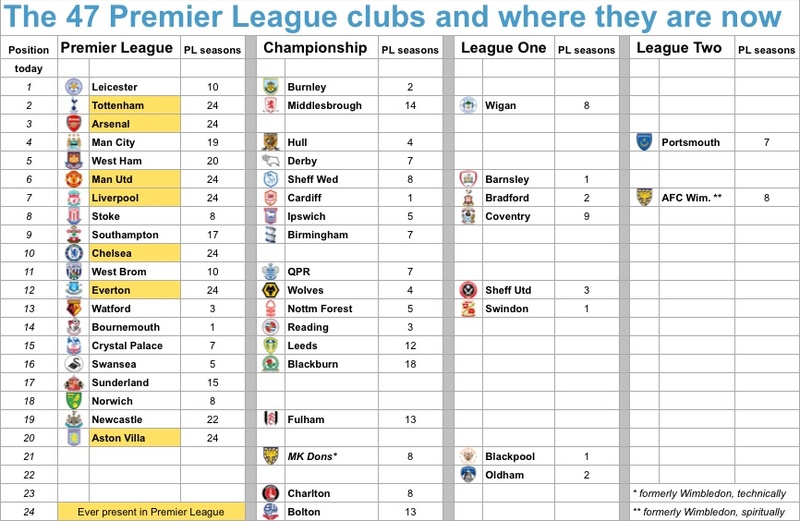 That’s more than half of the 92 clubs in the four professional divisions. It’s become a majority experience. Mobility continues to be a feature of England’s league pyramid, up and down. Bournemouth became the latest newcomers to the Premier League this season. And Aston Villa, who host title aspirants Tottenham this weekend, are hot favourites to be relegated. Demotion for Villa would be a landmark event. They are one of only seven ‘ever-present’ PL clubs; the others are Manchester United, Arsenal, Chelsea, Liverpool, Everton and Spurs. The last ever-present club to drop down to the second tier were Southampton after 13 successive PL seasons; that was at the end of 2004-05. They followed Leeds, who lost their ever-present record and made their way towards oblivion the year before. Aside from Villa, two of the three bottom-four clubs in the current PL table (Newcastle and Sunderland) have been present for a significant majority of the PL seasons. Newcastle have missed just two PL campaigns and Sunderland nine. 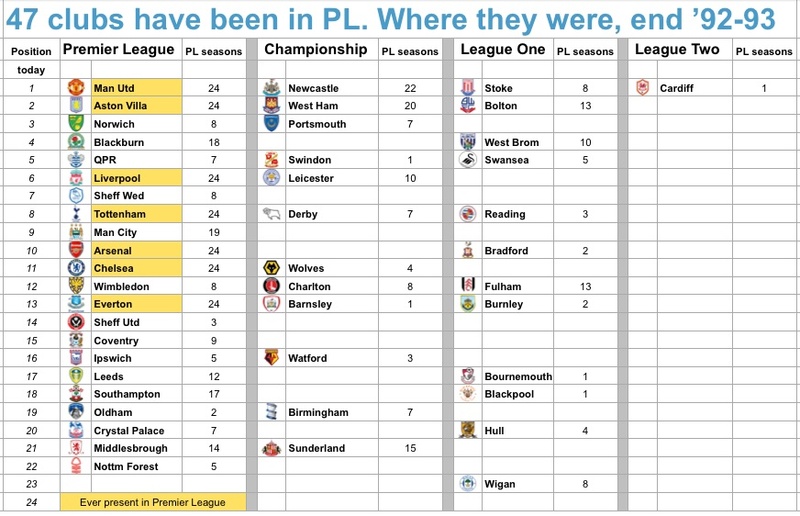 In the Championship, clubs with Premier League histories are queuing up to return; 14 of the current top 16 clubs in that division – the most competitive in Europe – have had Premier League experience. The odd ones out seeking a debut at the top table are third-placed Brighton (vying for automatic promotion) and Preston in 10th place, seven points from a play-off place. Lower down the pyramid still, Wigan will be hoping to climb back into the Championship from League One; it’s only three years ago they were fighting for Premier League survival. Portsmouth are looking to make an even longer journey from League Two; it’s only six years ago that they were ending their seven-season stay in the Premier League. So where did it all go wrong, Randy? Randy Lerner bought Aston Villa in 2006 and for the first four years, things ran smoothly under his stewardship, and it’s not a coincidence that those four years were also the four years that Martin O’Neill was manager. Lerner invested in players, and also significantly, player wages, during those first four years, as the chart below summarises. For most of the Premier League’s history, the current madcap season aside, there has been a strong relationship between wage spending and success. The more you spend, the better you do, which is logical when you think about it. 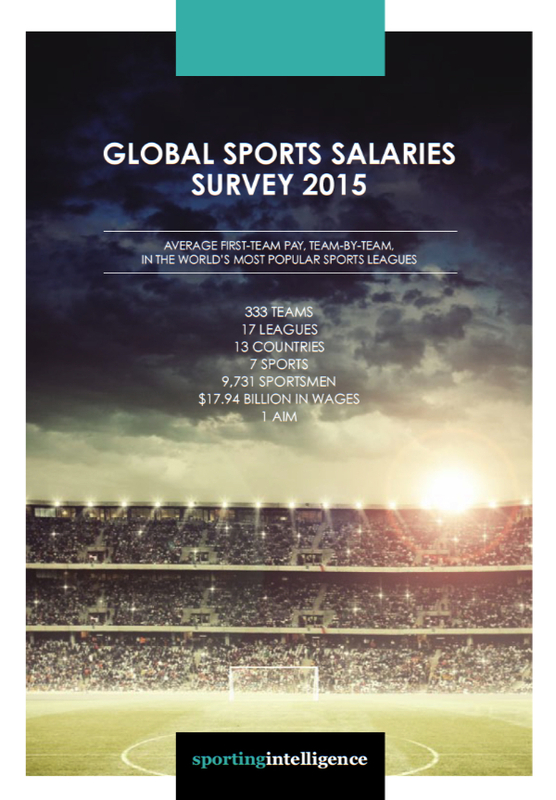 You get better players by paying more, all things being equal. (See ‘It’s the economy, stupid!’ for more). And in Lerner’s early tenure, he allowed huge increases to Villa’s wage bill, almost doubling it between 2006-07 and 2007-08, adding another £20m the following year and another £10m the year after that. He was also allowing tens of millions in net spending each summer. This is a short overview, by necessity, but in a nutshell Villa’s wage bill was routinely the sixth biggest in the division, and after O’Neill’s bedding-in season, they finished 6th, 6th and 6th. Summer 2010 is where it started going really wrong, O’Neill leaving and Lerner saying the pair ‘no longer shared a common view as to how to move forward‘. Lerner also said Villa needed to be ‘as competitive as possible given our size and resources’. In other words, it was time to be more prudent, financially. Again, the graphic below summarises what happened next; a succession of decisions that diminished the playing squad, slashed the wage bill (catastrophically, in 2011-12, one might now argue), and led to serial instability in the managerial chair. All this brings Villa to the edge of a hard and painful fall now. An article on this website as long ago as December 2012 explained why QPR were doomed to relegation that season and how their inevitable demotion (which happened) was a clear case of predictable failure, economically foreseeable. The same piece also highlighted how the warning buzzer first shrieked at Villa in the 2010-11 season, heralding tough years ahead unless systemic failures were addressed. What happened to Villa after that 2010-11 season was finishes of 16th, 15th, 15th and 17th and a consistent flirtation with relegation that now looks inevitable. From Premier League ever-presents, they are heading to the second tier and an uncertain future that carries almost a 50 per cent chance that their drop won’t end in the second tier. When the Yanks are the story, the world turns its head . . .